A couple of years ago I found myself in mid-America for a few days, attending a conference with folks from all around the country. I connected with a few people who weren't hunters but were a bit fascinated by someone from Alaska and the hunting lifestyle many of us choose. It seems like even for socially inadequate individuals such as myself, being from Alaska invites tolerance wherever you go. We were having dinner the last evening and one of my new friends asked, with no malice, "Why don't you just take photos of the animals you hunt, isn't that the same thing?" Pointing at the partially eaten steak on his plate, I replied with a smile, "Sort of like taking a photo of the steer that provided that steak and putting it on your plate instead." "Fair point," he smiled back. Nothing will take the place of the pursuit and taking of game that will provide meat in the most honest way possible. The bittersweet moment when the shotgun barrels swing past the bird, or the crosshairs line up on the big game animal, and the trigger is pressed, cannot be understood, nor perhaps should it be, by those who have not done it. Even so, his question, in today's world, perhaps deserves a better answer. Photography has always been a hobby for me, but it did not play a role in the hunting of my younger years. The occasional "hero shot" after the game was down was about it. I was driven to secure game for the table, and fussing with a camera didn't fit in. Nevertheless, I took thousands of photos with my SLR (single lens reflex) film camera until 1994, when a fire destroyed all of those moments in time. Work occupied most of my time for the next 20 years, and the digital age was in full swing when I returned to the outdoors for my sanity. For the first time, with pocket digital cameras available, Christine and I had one in our pockets while hunting. The reward was re-living those moments through photographs. 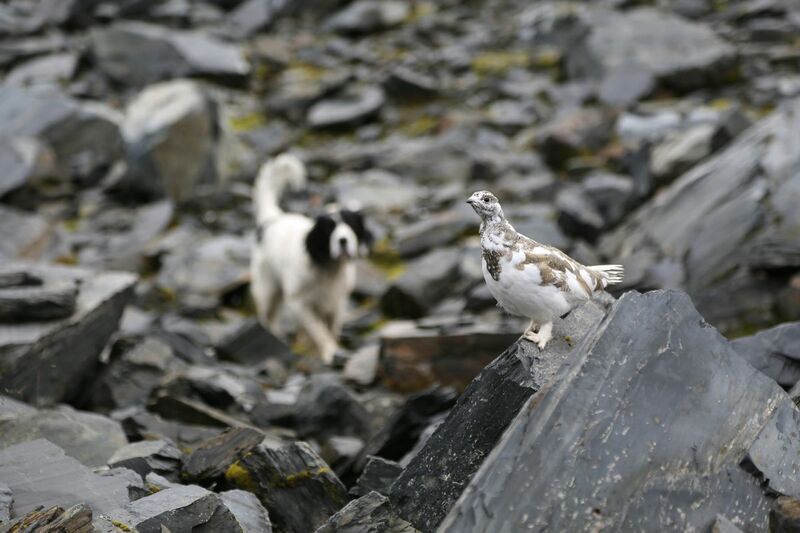 When we started following, or perhaps better stated, when we started trying to keep up with our beloved English setter as he coursed the high country, the sight of his physical gifts and his drive demanded the making of quality photos. The burden of carrying a full-frame digital camera seem trivial. He changed our lives more than we could have ever imagined, and he cemented the camera to my chest in all our outings. The defining moment in hunting and wildlife photography for me came on a mid-September day while hunting whitetail ptarmigan in the high country where the Dall sheep make their living. Winchester led us into a boulder-strewn valley that harbored a trickle of mountain runoff, the banks lush with the lichen whitetails love to eat. He went on point near the granite face at the head of the valley. It took 15 minutes to climb to him, and as we approached, we could see a whitetail crouched on top of a boulder, Winchester below with his intense stare on the bird. I forgot about the 28 gauge slung on my shoulder when Christine said, "You have to get that image." At 40 yards out, the ptarmigan became aware of my presence, and I slowed my approach, talking in a low voice — "how you doing, what a beautiful day," that sort of thing. Expecting the bird to fly any moment, I started pressing the shutter button. But he didn't fly away. When I was perhaps 20 feet away, he stood up straight and cocked his head. My heart was pounding out of my chest and in an instant I experienced the moral conundrum that forever changed how photography of animals would go for me. This beautiful bird was giving me permission to paint him in digital imagery. I could not consider shooting him. Turning to Christine, who was 20 yards to the side, I said, "we cannot shoot this bird." In her softest voice she said, "I know." Since then, perhaps because my focus has changed a bit, these encounters are routine. It seems a bit like the grizzly bear we observed on a caribou kill, with caribou milling all around him. The caribou sensed no immediate danger and were going about their business. I've always held a belief that animals sense this in humans as well. They know if you mean them harm. My ancestry includes a small part Lakota and I often wonder if that gene, perhaps one-sixteenth of my makeup, dominates my relationship with nature. For me the natural world has always satisfied my spiritual needs. I've always wondered about the belief that photography steals the spirit. I've struggled with the concept a bit, but I've come to believe that if the animal gives permission, the spirit remains intact. Since then, photography has been an integral part of all of our outdoor endeavors, and we have adopted a policy that close photos will not be made of animals without their permission, and we won't shoot an animal that we photograph. We have come to realize that while photography is not the same as hunting, it can be just as rewarding in a much different way. In a world that has changed and will continue to change as the human biomass degrades the earth, the hunting world I grew up in no longer exists. With the few exceptions that are influenced by agriculture, game is no longer abundant. It is "sustainable" in a manner of regulation that often has me in wonderment. We don't hunt big game much anymore, only occasionally and when the quarry is abundant. With the fish available to us and the bird hunting with our dogs, we can only eat so much. I don't believe in taking game and then giving it away so I can kill more. There are folks out there who need the meat more than I do and I feel better leaving it to those willing to work for it. In this world, photography brings me the close relationship with nature so critical to my spiritual needs in a way — and I get it's just my way — that meets some of those needs.